Last weekend at Ascot in the Champion Stakes, Newmarket’s own champion Frankel completed his racing career with his fourteenth win from as many starts, and now retires having never known defeat. Although being unbeaten is not the sole characteristic of a champion, Frankel has joined a select group of horses that also managed to maintain a perfect race record. In the early history of thoroughbred racing, as the breed was still developing, several great champions went through their careers without a single loss, in part due to their significant physical superiority over their rivals. Many of these horses went on to become great sires, and contributed their successful genetic material to the improvement of the breed. The great Eclipse, one of the forefathers of the thoroughbred, was untested and unchallenged throughout his eighteen race career, and was ultimately retired because owners refused to run their horses against the unbeaten champion. His superiority was so pronounced that the phrase ‘Eclipse first, the rest nowhere’ came into being, and several of his later races were walkovers as no rivals were willing to challenge him. Other early breed shaping sires, such as Highflyer and Flying Childers, also completed their careers without defeat. Highflyer won all fourteen of his races, including two renewals of the Great Subscription Stakes and the King’s Purse at Lichfield, and went on to sire many great horses including Derby winner Sir Peter Teazle. Flying Childers, a son of the Darley Arabian, only ran six times but was so superior to his rivals that half of his races were walkovers. 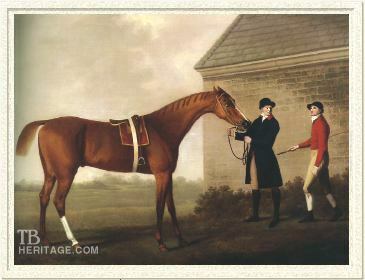 Flying Childers was a great success at stud, and was the damsire of the fourth great 18th Century sire, Herod. Two immensely important sires of the 1800s added their names to the list of unbeaten champions. The Tetrarch, one of the greatest two year olds and sprinters in the history of the sport, possessed unrivalled swiftness and precocity on the racecourse, and passed both of those traits on to his many offspring. As well as improving the speed of the thoroughbred, the so-called ‘Spotted Wonder’ was a significant source of the grey coat colour in racehorses, and many of his descendants display his unusual colouring. The other great sire, St Simon was unbeaten in nine starts including the Ascot Gold Cup, and had a profound influence on the English thoroughbred, as his offspring possessed both brilliant speed and great class and stamina, making them ideal Classic horses. Intriguingly, his coverings of the undefeated mare Perdita II produced two of the best horses of the era: Derby and St Leger winner Persimmon and Triple Crown winner Diamond Jubilee. An earlier Triple Crown winner, Ormonde, became the first to remain undefeated whilst completing the series, with a perfect record in sixteen starts despite pronounced breathing problems. Fellow 1935 Triple Crown winner Barham was the only other such horse to avoid a loss in his career, despite being incredibly lazy in training and when racing. The 20th Century saw a couple of undefeated horses who went on to become extremely significant sires. The great Italian horse Nearco, owned by renowned breeder Frederico Tesio, won all fourteen of his races, including the Italian Guineas and Grand Prix de Paris. His record as a stallion was outstanding, as he established the most dominant sire line in history thanks to his sons Nasrullah, Nearctic (sire of Northern Dancer) and Royal Charger. Nearco’s Italian compatriot, also bred by Tesio, was the mighty Ribot, who was unbeaten in sixteen races. Ribot was initially given little respect by the established British handicappers, but proved himself one of the greatest racehorses of the century by winning two renewals of the Prix de l’Arc de Triomphe and the King George VI & Queen Elizabeth Stakes in great style. He went on to become a very important sire both in Britain and the USA. In more recent years, one significant undefeated horse was Godolphin’s Lammtarra who, despite serious illness, managed to win the Epsom Derby, King George and Arc in his short four race career. Another Arc winner, the brilliant filly Zarkava, was unbeaten in seven races whilst winning the French 1000 Guineas and Prix de Diane (French Oaks). Towering above all of these undefeated horses in terms of race record is a Hungarian mare from humble origins, the magnificent Kincsem. A national treasure in her home country, she compiled an incredible record of fifty four wins from as many starts, and won many prestigious races throughout Europe, including the Goodwood Cup. Kincsem Park racecourse in Budapest is named in her honour, and the National Horseracing Museum features a beautiful bronze of her in the first gallery. Nowadays, it is rarer to see an unbeaten thoroughbred like Frankel, as the level of competition has greatly improved compared to earlier years, whilst the thoroughbred itself has become more specialised, and therefore more dependent upon factors such as race distance and ground condition. Furthermore, the feat of dominating three crops of horses, as a juvenile, three year old and mature horse is a great accomplishment. Whilst many great horses have tasted defeat on occasion, the idea of an unbeaten champion holds a special kind of allure, and assures that Frankel will be hailed for generations to come. Note, this blog discusses European horses only, and so makes no mention of undefeated horses from other racing jurisdictions, including Black Caviar from Australia.